Tarangire Safari Lodge is situated on an elevated ridge overlooking the Tarangire River, located approximately 120 km away from Tanzania ‘s safari capital, Arusha. Throughout most of the season a variety of game can be viewed from the rooms and the main building, even whilst guests relax on the terrace, herds of elephants can be seen passing below. The lodge offers bungalow and tented accommodation, however if you are looking for the authentic African experience, we advise staying in one of the 35 deluxe double tents. These safari tents are complete with comfortable beds, and even have electricity and en suite w.c. with a solar heated shower. If you are still not convinced about staying in one of the safari tents, you might feel more at home in one of the four bungalows made from stone with thatched roofs, and have en suite bedrooms. The lodge is renowned for friendly hospitality and you are assured of a relaxing stay and appreciating the abundance of wildlife in this beautiful setting. After a day of game viewing, cool off in the swimming pool from the midday sun. 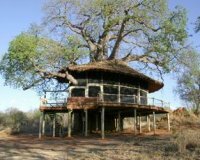 Our suites are perched high up in the age old Baobab and Marula trees. Astride the path of the Elephant Migration, Tarangire Treetops sits alone in a private game reserve bordering Tarangire National Park and the Maasai Steppe amid rolling, baobab-studded hills with views to Lake Manyara and the Rift Valley wall. Tarangire Treetops has a magical, adventurous and exotic feel, appealing to the childlike senses of fun and awe. The boutique style lodge, exudes a timeless essence, its majestic trees and the landscape, sparking the imagination to times of yore. Twenty suites, each 65 sq metres with a private balcony, are distinctively and lavishly furnished. Natural materials are blended with contemporary Africana décor, to provide guests with a unique and most memorable safari experience. Encasing a vast Baobab tree the spacious and tranquil dining room, reception and lounge overlooks the swimming pool and a waterhole that sees a constant flow of wild animal visitors. With the natural beauty of the hills and dry river beds begging to be explored, guests can enjoy guided walking safaris, day or night time game drives and the enchantment of bush dining. On the eastern side of the Tarangire River stands Tarangire Sopa Lodge. The lodge is located in the Tarangire National Park and is one of Tanzania's most easily accessible conservation areas. Getting there is pleasant enough with plentiful game to be viewed on the way. 75 suites offer you accommodation and have wall-to-wall carpeting, a private lounge with a mini bar, a bedroom with two queen size beds and ample room for a third. An en suite bathroom with shaver sockets and a hair dryer, and a private veranda offers stunning views over the baobab studded landscape. Polished marble floors and full air conditioning creates a wonderfully cool atmosphere compared to the afternoon heat. Jump into the pool and refresh in between game drives or take in the African sun at the pool bar. Among the wildlife to see here, the elephant population stands out as one of the highest in Tanzania but also has the highest number of recorded bird species than any other habitat, making it a birders paradise. Oliver’s Camp is situated in the remote South-East section of the Tarangire National Park, right in the park’s unspoilt wilderness zone. In fact, the camp is ideally located to see large concentrations of elephants, cats and other animals around the stunning Silale swamps and in the trademark Baobab country of Tarangire National Park. The design and atmosphere of Oliver’s Camp are that of a true classical bush experience, and the camp crew has been a close team for many years, which clearly shows in the quality of food and the personal service. Oliver’s Camp offers a great range of high quality activities, such as game drives, walking safaris and fly-camping (private light-weight camping under the Tarangire stars). To ensure the feeling of absolute exclusivity and intimacy, Oliver’s Camp offers only 8 tents. Solid wooden furniture, spacious tents that bring in the Tarangire landscape and great interior will make you feel right at home. Each tent has en-suite bathroom facilities which are half inside and half outside the tent. Welcome to serenity in the wild! Roika Tarangire Tented Lodge is situated only 5km from Tarangire National Park Gate. Set out at the edge of the national park, a stones throw from the Tarangire River. The lodge is made up of twenty one luxuriously equipped tents with uniquely hand carved furniture based on the Maasai culture and the surrounding wildlife. Each tent has a private balcony, ideally set out to give you a relaxed view of the wilderness. Roika Tarangire Tented lodge the perfect location for a relaxed and refreshingly wild stay. Maramboi Tented Camp offers permanent camp facilities and endless vistas of rolling golden grasslands and palm lined desert between Tarangire and Manyara Lake. The lodge offers 10 spacious tents on generous, ample wooden decks. They all have en suite facilities and private veranda. Activities include game drives, guided walking safaris, bird watching on the shores of the not too distant Lake Manyara and cultural interaction with Datoga and Maasaî, whose bomas populate the adjacent land. Tarangire River Camp is just 3.5 km from the main entrance to Tarangire National Park, set on 25,000 hectares of concession area. The camp has 20 luxury safari tents, which are en-suite with hot and cold running water. The tents are tastefully furnished with all the comforts you will need whilst on safari and open out onto stunning views of Mount Meru and Mount Kilimanjaro. Meals are a delicious affair, dinners are served by candlelight in the thatch and timber elevated dining area, with dramatic views across the Maasai plains, where a friendly and attentive staff are always on hand to cater to your every need. Activities from Tarangire River Camp include game drives, guided walking safaris, birding watching and cultural safaris visiting the Maasai Village. 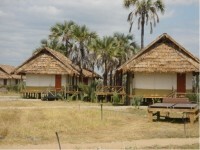 Swala camp is located within Tarangire National Park borders. The park is an easy 115 kms from Arusha on an excellent roads and the camp itself is another 67 kms into the park. Tarangire is noted for its elephant population and spectacular baobabs of every shape and color. Nestled in a remote pocket of the Park, Swala is situated in a copse of majestic acacia trees at the edge of the Gurusi wetlands and the unfurling savannah beyond. This section of the park is exceptionally private, with no other camps around. The stands of ancient baobab trees, large family herds of elephants, prolific bird life and dry season concentrations of wildlife make Tarangire the classic Africa of lore – feted by explorers, immortalized in documentaries and sought after by the discerning traveller. This picturesque safari hideaway is exclusive in the southwestern corner of Tarangire National Park, affording guests private gameviewing, wilderness luxury, and a privileged glimpse of an Africa, untrammelled by tourism. Swala offers an experience that is both exclusive in its setting and luxurious in its style, the ambience of old, wild Africa with a breathtaking location that defines the safari as surely as the wildlife that inhabits it.